I have to say, I’m a bit late for this birthday bash. December is the month three of my novels celebrate their publication anniversaries. 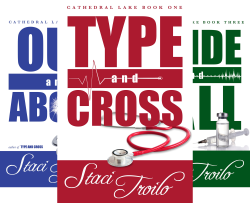 All three—Type and Cross, Out and About, and Pride and Fall—comprise the Cathedral Lake series. While I missed the official celebration dates, I’m still in a festive mood about the novels, and I thought I’d share how they came to be. Once upon a time, I had an agent who was shopping my first romance novel around New York. I assumed I was supposed to continue working on the series, so I dove into book two before book one was purchased. Halfway through, my agent chastised me and told me I should be writing in a different genre, because the romance genre was glutted and hard to sell. Why, then, did she offer to represent me to begin with? I couldn’t figure it out, but I dove into my idea file to look for something in a different genre. Turned out, though, almost all my story concepts were for the romance genre. Various sub-genres, but still, they were all romances. A few years earlier, my husband had blood work done. It was nothing serious, just routine. But when he got his lab report, he was puzzled about his blood type. Both of his parents were O+, so he just assumed he would be, too. But he wasn’t. So he talked to his parents about it. He wanted to be sure he knew his parents’ correct blood types, in case there was ever a medical emergency. Turns out, he was right about the types—his parents were both O+. Turns out he was wrong to ask his parents about it—his father freaked out. I, by nature, am a curious person. And I avoid conflict like the plague when I can. When this all hit the fan, I did what came naturally to me. I researched how blood types are determined. It’s a fascinating subject. Each person, despite having one “type” (or Rh factor) stated, actually has two determinates—one from the mother and one from the father. So anyone with a positive blood type could actually have one positive antigen and one negative antigen. Because there’s even one positive, that person will state their blood type as positive. But that negative antigen is still there, and it can be passed on to offspring. That means that two blood type positive parents could actually have one positive and one negative antigen each, and both the mother and the father could pass on the negative, not the positive, antigen, resulting in a child with two negative antigens. In other words, a child with a negative blood type. I was thrilled that I’d discovered the mystery behind my husband’s blood type. I wanted to calm everyone’s anxieties. Turns out, I didn’t need to. The blood lab contacted my husband and reported their error. I don’t know what made them review their results—but it was good that they did. The family relaxed, secure in the knowledge that all was as it should be. But I couldn’t stop thinking about it. Not only was the Rh factor information fascinating, the A, B, O research was compelling, too. I mulled things over for a while, and the seeds of a medical drama sprouted and grew into the Kellers, a dysfunctional family who lives in Cathedral Lake, a fictional town in Western Pennsylvania. They are deliciously complex, and the pages of their stories pretty much wrote themselves. I was halfway through the first novel in that series when my agent told me mainstream fiction—which is what she categorized the series as—were the hardest novels to sell. That made two series she didn’t want to promote. And she offered next to no guidance in what I should do next. Left to my own devices, I did what I think any frustrated new author would do. I fired her and signed both series—the romance and the mainstream—with a smaller publisher. It was a relief to find a company who was as excited about my work as I was. And the Cathedral Lake series was quickly finished and is now a completed trilogy. It might be a belated celebration, but I’m still commemorating the novels’ birthdays. 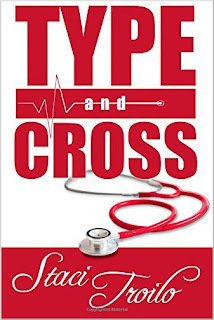 Type and Cross details one family’s journey from devastation to redemption, Out and About chronicles the merits and miseries of freedoms denied and gained, and Pride and Fall is a story of healing and personal growth. Without a little serendipity and a lot of luck, the Cathedral Lake series might never have come to fruition. Enjoyed the guest post, Staci and Anastasia! The negative and positive elements in blood types sound like they work in the same manner as dominate and recessive genes determining things like eye color, hair color, etc. Genetics have always fascinated me. I've even done some minor research purely out of personal interest. This was a fascinating post, and so interesting to learn how the Cathedral Lake Series came about. Having read all three of these novels, I found them to be riveting and intricately plotted with characters who stuck with me long after I had finished reading them. Good thing you didn't listen to your agent, Staci, and congrats on the book birthdays! This is a wonderful story behind the story. It's similar to how my brown eyed wife gave birth to our blue eyed daughter. She obviously carried a recessive gene and it was the only one I could provide to match up. I loved this book, by the way. If anyone is on the fence here, it really is a wonderful story. Thank you, Felicia. I appreciate your interest. And believe me, I know all about having too many titles in the TBR pile. And thank you for the kind words about the series. And thanks for the kind words about Type and Cross. Thanks to Lois and Anastasia for hosting me today. It was fun to write the post and visit with everyone. 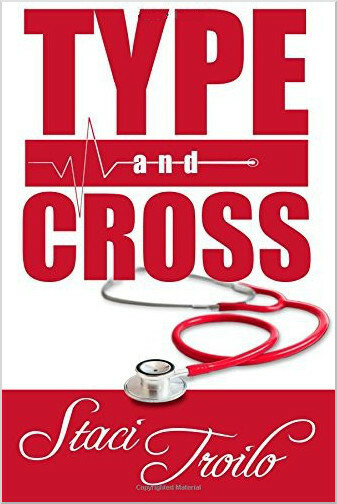 The blood typing aspect fascinated me in that book - it's interesting to know you drew on real life experience for that. Look forward to reading the third book in this series - highly recommend the first two! Thanks, Teri. I appreciate that. Reminds me of my panic when my daughter became a blood donor - how could she be O+ when we were both A+, had babies been swapped at the hospital? Just over 6% chance! Loved the story of your husbands blood and your por father-in-law. Thanks, Janet. I can imagine how scary that was for all of you! So glad it worked out okay. The determination of bloodtype is certainly fascinating. The study of genetics is fascinating. I can only imagine the momentary panic in your husband's family. I loved your Cathedral Lake series - kept me intrigued from start to finish. Happy (belated) anniversary. Thanks, Joan. My father-in-law is a very moral, pious man. You can't possibly imagine his shock--and my mother-in-law's panic and desperation. They are very much in love and dealt with the situation well, but... well, you know.